While Simon was under the weather over the school break, he requested a chicken soup with rice. Like in the book Chicken Soup with Rice by Maurice Sendak. When I served this one to him, he said that it was good, but it wasn’t really what he was thinking of. I’m pretty sure he was looking for a little Lipton packet or a Campbell’s can of Chicken and Rice Soup. Oh well, it was a hit with everyone else and we polished off this pot of soup in a hurry, plus I sneaked in a little extra garlic to boost everyone’s immune system. For this soup (and many others), I boiled the chicken, pulled it out when it was cooked, diced it for the soup and set it aside, reserving the broth for the soup. If something calls for cooked chicken and for chicken broth, I usually try to make both together. I used a food processor to finely chop the onions, carrots, celery and garlic, so they would be in very small pieces for my littlest eater, but you could also chop them by hand. Heat olive oil in a large Dutch oven. Saute onions, garlic, carrots and celery in oil for 10 minutes. Mix in herbs. Add water and chicken broth. Bring to a boil and add wild rice. Turn heat down and allow to simmer for 20-30 minutes. 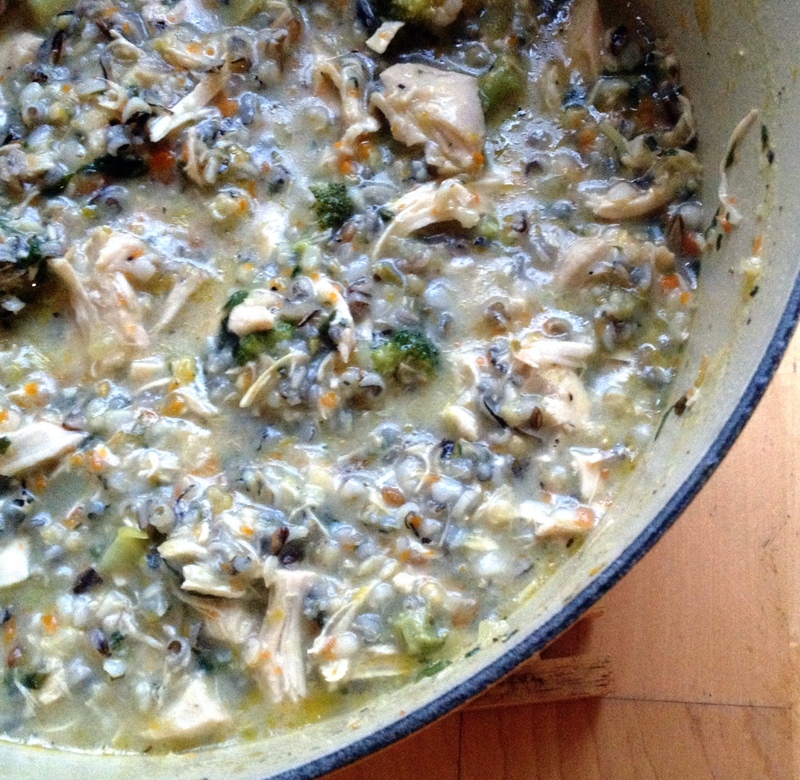 When rice is tender, add broccoli, cream of chicken soup and cooked chicken. Cook 10 more minutes. Add salt and pepper to taste.